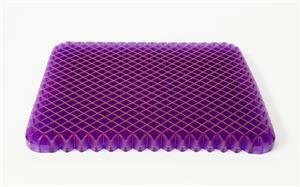 The Simply Purple Seat cushion is all about plush cushioning. Simplify your life with the Simply Purple. Pun absolutely intended. Basic Care: Cover - Machine wash cold with like colors, tumble dry low. Cushion: Wash with warm water and mild detergent. Let air dry. 18" wide x 16" deep x 1.25" thick.